I recently acquired the Numenera core rules. I’d heard a lot about it and it thought that maybe an old grognard like me should enter the 21st century or, to be more precise, the ninth age, the time in earth’s future when Numenera is set. The ninth age is a billion years into earth’s future and while the setting is essentially pseudo medieval fantasy (humanity has slipped back to that kind of era) there have been eight great civilizations that have risen and fallen. These civilisations are mysterious and unclear in their nature. However, some weren’t human and some had interstellar and even inter-dimensional travel. This means that there’s lots of technology lying about to be found and used by the human population. Moreover there are strange and mysterious energies in the atmosphere that some humans (Nanos) can harness and use rather like magic. That’s the basic setting but it’s important not to think of this as some post holocaust RPG – Aftermath or Gamma World. Yes, there will have been holocausts perhaps that brought down the previous great civilizations but this isn’t some post nuclear primitive world where the players will unearth a machine gun or an old iphone. It’s much stranger than that and much more like science fantasy. In literary terms I think the creators of the game have mentioned Gene Wolfe’s book of the new sun series. Another comparison could be Moorcock’s Hawkmoon books. When I first got into RPGs in the early 80s one of the great advertising lines of RPG publisher’s was that to run fantastic adventures for your friends, “All you need is this book.” But it was never quite true. Dungeons and Dragons meant you had to buy three rule books at least (Player’s Handbook, DM’s Guide and Monster Manual), Runequest meant you really needed at least Cults of Prax and Cults of Terror. But with Numenera it really is the case that you only need the core rules. There’s masses of background for the setting, lists of artefacts, and monsters, all with full colour illustrations. Yes, you’ll want to buy the supplements (I’ve already bought the Ninth World Bestiary) but you don’t have to. I honestly think you could play regularly for several years with just the core rules. The rules to Numenera are pretty straightforward and slick, deliberately so given that the game wants to encourage action and story rather than crunchy simulationist stuff. For a BRP grognard like me, I was pleasantly surprised by the simplicity and logic of the central concept. In the same way that BRP reduces every action and task to a percentage, Numenera reduces it down to a score out of 10. Sometimes the score is determined by the rules (monster and NPC combat being the best example) or by the GM. What’s appealing is that it’s easy to conceptualise degrees of difficulty. How difficult something is on a score out of ten isn’t far removed from the way people think in ordinary life. For example, the players have to climb a rock face. The GM says it’s pretty difficult and gives it a 5 out of 10. The 5 is then multiplied by 3 and to climb the rock face, the players must each roll a 15 or more on a d20. Now I imagine that some of you are ahead of me at this point and have seen the obvious problem with such a system – anything given a difficulty level of 7 or more is literally impossible if multiplied by 3 and rolled on a d20. Well, yes it is because tasks like that are pretty difficult. For example, suppose that rock face had been made from some strange alien glass and covered with ice. The GM may have said it’s a 8. So a 24 or more on a d20. This is where skills, artifacts and stats come in. Your character might have a climbing skill and so he/she can reduce the difficulty two grades (now a 6) and then spend some points from their agility stat poll (more on that later) to reduce it by another grade (now a 5). So the roll to climb is now a 15 or more. Now difficult but do-able. For grognards like me and my group, the most unsettling thing about Numenera is the stat pools or “spend system” element of the game. I know these type of systems are out there and nothing new these days but old timers like me are used to stats (STR, INT, DEX etc) being fixed and the only stat that goes up and down is hit points or maybe power in Runequest or SAN in Call of Cuthulhu. 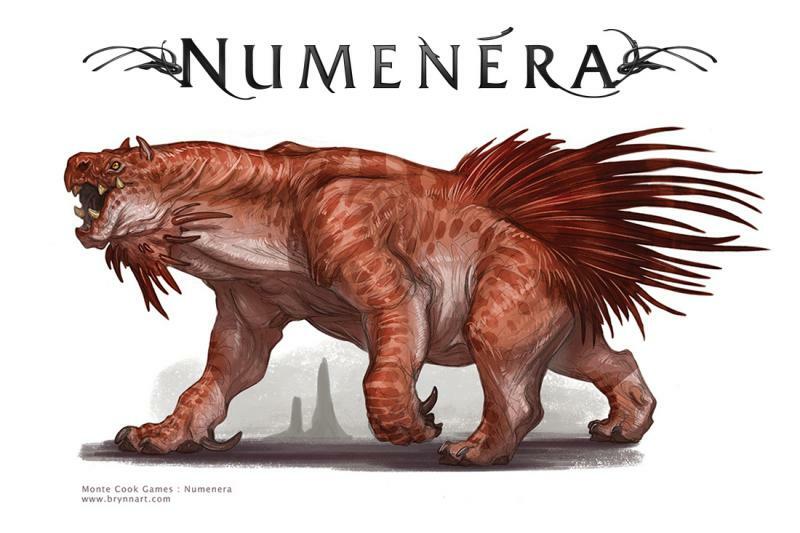 Numenera has three statistics – Strength, Agility and Intellect. As described above, the player’s use these stats as points to spend to achieve certain tasks or combat rolls. To go back to the example above of climbing the sheer glass wall. To reduce that 8, your character can spend three points from, for example, an agility of 12 to knock the difficulty down. Thier agility is now 9. Points replenish throughout the game, but it’s an odd concept on first reading when you’re used to fixed stats that give bonuses or penalties. I think this is the element my group might struggle with, especially when you consider that the stat pools also operate as hit points. It’s a big leap to ask players to consider using points they might need to soak up damage later to achieve tasks. That said, I can see how the spend system ties into the idea of a more narrative form of RPG, which is one of the things Numenera wants to achieve. Imagine a point in the game where the villain raises his sacrificial dagger to strike and your character wants to knock it from his hand with a well placed arrow. A difficult shot but wouldn’t it look great in the film? Spend some stat pool points and you have a better chance of achieving it. The spend system allows the players to influence that narrative and events in a more dramatic way. Again, for us grognards this seems a bit odd. But ask yourself this – how many times have you wanted to play a strong warrior and rolled a low STR score? Or a clever thief and rolled a low INT? That can be dissatisfying and resolving the problem by allocating points can lead to power gaming and min/maxing. Numenera offers players the chance to be what they want but without allowing them to power game the stats. There are lots of other interesting elements of the system. The idea that the GM never rolls a dice is a very unusual idea. The monster and NPC stats are very easy to create on the hoof, which give the GM lots of flexibility. It remains to be seen how Numenera will work in play. I’m still wading through the detailed setting. I think my group will find it a challenge in some ways but not in a bad way. If things get tricky when I’m running it I may just have to spend some intellect points and lower the level. We’ve played it regularly and had a lot of fun with it. However I’m now suffering from a bit of numenera GM burn out, I think. The tricky thing about running numenera is not so much the constant unexplained stuff but more the strain of “heavy lifting” when it comes to describing things. As a GM you’re faced with conveying strangeness all the time – what does this monster look like, what’s this building made of, what’s this npc wearing etc. Nothing is familiar so there’s a lot of descriptive burden on the GM. It’s a problem with a lot of Sci fi rpgs I suppose but it feels more acute with numenera. That said, I’ve run some very enjoyable games of it. Perhaps better as one shots where you can hone the descriptions and atmosphere.. Thanks for the reply. Those issues are the reason I tend to stay away from sci-fi games. Any chance there might be a future grogpod about your experiences with Numenera?